Address: Faisalabad Institute of Cardiology, Officer Opposite Chenab Club, Faisalabad. 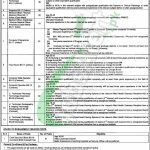 Apply for FIC Jobs | Faisalabad Institute of Cardiology Jobs 2018 For BS-19 To BS-09 Advertisement. Applications are being offered from Faisalabad Institute of Cardiology intends to appoint the well disciplined, hard-working, eligible and educated applicants are required to fill the Faculty posts and the following posts are going to be displayed before you to apply such as (Anesthetist, Radiologist, Pathologist, Registrar, Medical Officer/Woman Medical Officer, Medical Officer Anesthesia/Woman Medical Officer Anesthesia, Computer Programmer, Head Nurse, Computer Data Operator, Computer Operator, Jr. Technician Pharmacy Technology (Dispenser), Jr. Technician Radiography & Imaging Technology (Radiographer), Jr. Technician Pathology Technology (Lab Assistant), Chief Security Officer) are the posts which need to be filled with the overall qualification of MBBS/MS/MD/FCPS/ Ph.D./DSc/MCS/MSc/BCS/ICS/FSc with relevant expertise are required to apply for such posts. The appointment will be made according to the policy of Government. Age limits are different for each post. The attractive pay package will be given with suitable atmosphere and growth opportunities. Now, I will let you know about its further details below. Faisalabad Institute of Cardiology is the Government created institute which is providing the education as well treatment to the heart patients with great facilities and intensive care. Highly professional doctors are lying and doing duty there to perform their tasks hastily. Being a Govt institute it offers Govt jobs for male and females. Applicants are required to send the handwritten application addressed to Medical Superintendent, FIC accompanied with attested copies of all testimonials should reach the said address. The last date for applying is October 31, 2018. Only Punjab domicile holders are welcome to apply. In service, applicants should apply through proper channel. Last Date For Apply: October 31, 2018.